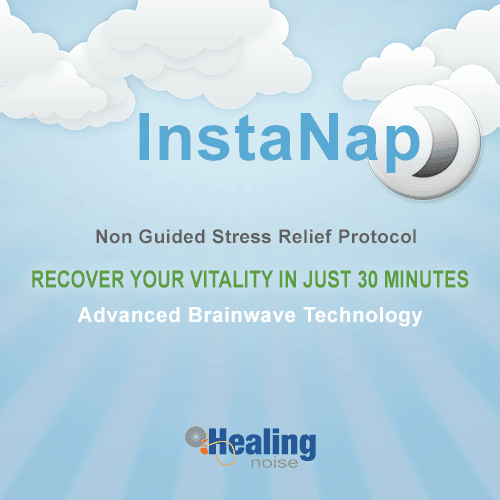 InstaNap is a fast acting sleep induction soundtrack created to assists those individuals seeking to obtain a restorative short period of sleep commonly known as “nap”. You will feel rejuvenated after a 30 minutes listening session which guides your mind and body to a restful state. The session is a ramp of Beta protocol which gradually ramp down to Delta for about 25 minutes and leading to Alpha region by the end of the session. This session is a popular choice among people with a very busy life style in need of a natural way to boost their energy level during the working hours. No music or vocal commands are present in this session, so you mind will focus on the sound frequencies responsible to activate the short sleep session. You will feel the relaxing effects of InstaNap just a few minutes after the beginning of the session. The Brainwave Protocol guides the brain from Theta to Delta, residing in that region for 25 minutes, then progressively awakes you to Alpha by the end of the session.